WWI: The Western Front, Christmas, 1914. Out of the violence a silence, then a song. 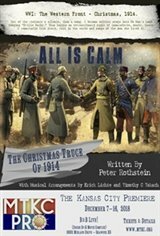 A German soldier steps into No Man's Land singing "Stille Nacht." Thus begins an extraordinary night of camaraderie, music, and peace. A remarkable true story, told in the words and songs of the men who lived it, featuring an 8-piece men's a cappella choir.